The Bluffs at Taluswood is a townhouse project in the Nordic area of Whistler Creekside, just up the hill from Dusty's and Creekside (the original Whistler Village), with various restaurants, grocery and other services. We're a 1 - 2 minute drive straight up from the Rim Rock Cafe, consistently one of Whistler's finest restaurants. Our 2 bedroom 2 bath townhome is 5 stairs up from the street then situated all on one level and is an end unit so you have the benefit of fewer neighbors plus decks on two sides. You will enjoy the spectacular views of the Dave Murray Olympic Downhill and Peak to Creek to the east, or the Tantalus Range to the south. We use a keyless entry that provides you the ultimate in security and convenience, so you won't need a physical key to enter. You'll love the heated floors when you step onto the bathroom or kitchen floor on a cold morning. Your entryway has a place to stow your skis/boards and ski boots. In the summer, you can confidently leave your bicycle in the secured bike cage in the parking garage. Further indoors, the master bedroom has a comfortable queen-size bed and a large deck that looks to the east, straight up the Olympic downhill run from approximately the finish line area. The master bathroom has a jetted bathtub/shower combination, and we provide plush towels, hairdryer, shampoo, conditioner and body wash. The second bedroom has double-size bunk beds. The kitchen is stocked to the gills with dishes, glasses, wine glasses, flatware, kitchen utensils, and miscellaneous oils and spices. Small appliances include toaster, coffee maker, tea kettle, power juicer, and fondue pot. Pots and pans are All-Clad brand, and we have also provided an All-Clad crock pot and two Le Creuset casseroles. Your refrigerator/freezer is huge, and your range, microwave oven and dishwasher are like new. We tried to think of everything so you wanted for nothing. There is also a large dining area, and your living room has plenty of seating area and a gas fireplace with TV, DVD player and Apple TV. For those beautiful barbecue days, we have a large Weber gas barbecue on the deck for your cooking enjoyment. In Winter, we're an ALMOST true ski-in/ski-out with a 2 minute walk onto the hill, and in Summer we're a short, fun downhill ride to the Valley Trail or wherever you would like to venture. Whistler Village shopping and activities are about 3 km away, so it's not far to the party, but it's always nice to return to the serenity of your townhome. Our names are Kumi & Paul. We love Whistler/Blackcomb and we're pleased to share our home with you. Please enjoy it and care for it just as we do. We want you to feel comfortable in your home away from home, and we hope you have everything you need to make your stay magnificent. We will spend most of our winters right next to you on the ski slopes and our summers outdoors on the trails. Creekside is our favorite part of Whistler because it's more "local", more serene, and lift lines tend to be short or non-existent (except on pow days where everyone heads up the mountain), and life is just easier. Creekside lifts are now open in the summer, with the bike park just a 30-second pedal away and Whistler Village is accessible from Creekside gondola or via the Valley Trail. We want you to have the most memorable vacation of your life, and we'll do our best to make it happen. We'll provide you a good value and we hope you will enjoy and appreciate the small touches that make any trip special. We appreciate good service ourselves, so you can count on us to take care of you before, during and after your stay. We retired from medical and finance careers at the end of 2013 and moved from our paradise in Hawaii to the outdoor wonderland of Vancouver to pursue our love of the seasons, the mountains and skiing. Most people thought we were crazy to leave the sunshine and beaches of Hawaii for the "cold" of Canada, but we were in Hawaii for over 20 years and we couldn't be happier being in Vancouver and in Whistler. For our first 3 years in Vancouver, we made the 90 minute drive from Vancouver to Whistler 50 - 60 times per season, and finally we said, "We need to own a place in Whistler!" We love Whistler. Though our primary home is in Vancouver, it always feels like we're coming home when we get to Creekside. We ski the whole mountain, but there's always something that feels special about those runs that come back to Creekside Village: the Dave Murray Downhill and the Peak to Creek always take us home. When we saw The Bluffs at Taluswood we fell in love again. The proximity to the Village, the serene surroundings and the views up the hill whispered to us and we had to have it. Two bathrooms: master bath has a shower/tub, and second bath has shower. We have a portable unit that will cool the room of your choice. Normally an air conditioner is not a critical item in Whistler. Including free wifi. Network name and password will be provided to you on site. Sofa (queen-size hide-a-bed), coffee table chest that contains bedding, 2 chairs, fireplace, TV/DVD/Apple TV. Fairmont Chateau and Nicklaus North golf courses minutes away. Others are a bit further. There are 5 steps up to the entryway without a ramp, but the unit is otherwise basically on a single level. Common spa just up the sidewalk with breathtaking views overlooking Alpha Lake and the Tantalus Mountain Range. 2 minutes to walk to the Advanced ski-in, and 1 additional minute to walk to the Beginner/Intermediate ski-in. Pray for snow from October to May, and for sunny summers! Our family of 4 thoroughly enjoyed our stay. The townhome has everything you need, is comfortable, and super clean! Access to ski hill is great! Thank you for making our trip one to remember! We’ll be back! Thank you. We certainly do hope you and your family will come back. You were lucky enough to enjoy our April snows, though any season is a beautiful time to come to Whistler. The unit is clean and will stocked and very comfortable for 4. It would be a bit tight for 6 and certainly small for 8. There is a short walk to and from the slopes for ski access. A unit above and the parking garage door below could generate noise but did not for us. The owners could not be more responsive and are very good at communicating about all things related to the reservation, including notifying us that the hot tub may be out of commission (it was not). They were very prompt and responsive in all aspects. I would certainly return and would recommend to others. We're glad you enjoyed your stay with us. We agree that our place is best for 4, and our maximum is 6. We hope you enjoyed the hot tub which is always a treat after a hard day of skiing, hiking, biking, or whatever activity you choose in Whistler. Our family of 6 all enjoyed this condo - love the serene location and access to ski runs. The condo felt new, comfortable and very clean and Paul and Kumi thought of every detail, instructions for everything. Paul was most communicative leading up to our trip, answering all my myriad of questions and made sure to be available during our stay. Glad your whole family could make it! That serene location is something we try to focus on with potential guests. We're happy that you appreciated it. It was a pleasure having you with us, and we hope you'll come back again. Nordic Estates lived up to it’s amazing ratings. The views from the condo were breath taking. The well appointed kitchen actually made us want to stay in for a home cooked meal. 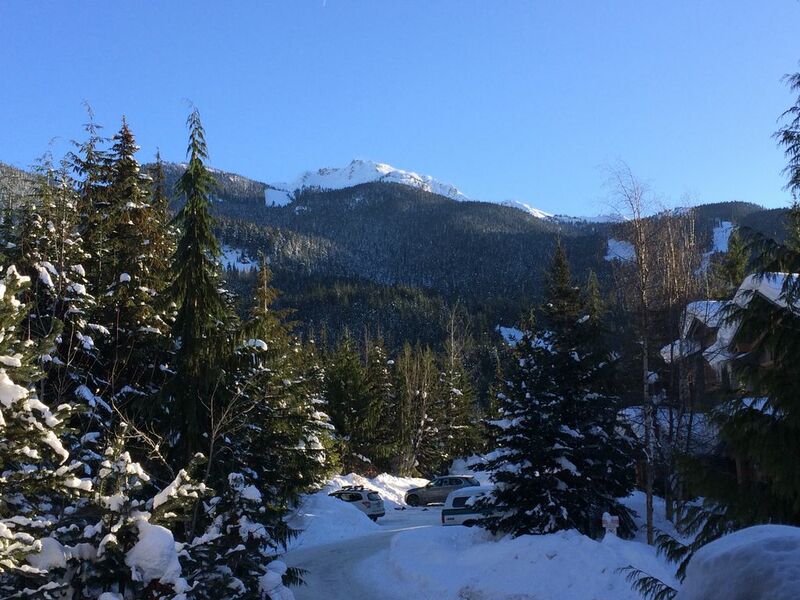 Good location to Creekside village, which is a much quieter and less busy access to Whistler. The proximity to the lower Dave Murray ski run worked well for the family. It is about 300 meters to access the slope and it is accessed from either a blue or black run. The owners (Paul and Kumi) were very responsive and provided great information on the condo. We would definitely be up for a return visit! Thank you! I think you've said it all. We're glad that everything worked out well for you, and we hope you'll come back and see us again. Really no bad thing to say about the place. There is enough room for everybody. I believe if you really tried you could get 6 maybe 8 people to stay here. It seems it would have 6 people comfortably. It is just a short walk from the slopes which wasn't bad. Worst part was just walking back after a long day but that's always the worst part no matter where you stay. The hot tub was just a short walk from our room. We got lucky that the hot tub was fixed by the time we got there. It was definitely used to relax the muscles. The room had everything we needed and more. It was just a short drive to Whistler Village if you are wanting to stay away from all the noise. The parking garage was nice for us to have. Kumi & Paul were awesome. I believe they are the most responsive owners I have had while using this site. They answered any question I had leading up to the stay and even during my stay. They were also very quick in responding to the point I felt bad for not responding as quick as they did. I would definitely recommend this unit for anyone looking to experience anything at whistler. We really try to meet the needs of every guest, and we're happy that we were able to do that for you. Thanks for staying with us, and do come back. Whistler is spectacular in every season. Fabulous Whistler family vacation spot! We chose Paul & Kumi’s Whistler Creekside condo for its ski in/out features as well as it’s size for our family -2 adults and 2 teenagers. We weren’t disappointed! The accommodation is exactly as it’s described and the owners go above and beyond in terms of stocking the condo- from fresh towels/bedding to a fully stocked kitchen to all the toiletries, made our stay one to remember. The skiing was incredible! Beautiful weather and each day had at least some new snow, making for fabulous conditions unlike what we’re used to in Ontario! I would highly recommend this spot to anyone and we’re hoping to come back again some day to enjoy this slice of heaven! Oh, yes, another great Whistler winter, and you were here for a beautiful part of it. We were happy to have you with us out here in the West. Do come back anytime! Our address is #17 - 2301 Taluswood Place. About 200 meters north of Creekside Village, turn at either the Highlands entrance or just up the road at the Nordic Estates entrance. The route to our townhome is closer from Highlands but more direct from Nordic. A)	From the Sea to Sky Highway, you may turn right at the Highlands sign, which is Whistler Road. Take the 2nd right turn, which is still Whistler Road, then the first left turn, which is still Whistler Road. When you reach the end of the road, you’ll see Whistler Lodge Hostel, and this is where you turn right onto Nordic Drive. Stay on Nordic Drive to the stop sign at Taluswood Place (almost at the top), and turn left, then immediately turn left again into “The Bluffs” complex. #17 is the end unit in the third cluster directly over the entrance to the parking garage and is well-marked. B)	You may also turn right at the Nordic Estates sign about 300 meters north of the Highlands entry. If you take this route, take the first right onto Nordic Place then take the first left onto Nordic Drive. Stay on Nordic Drive to the stop sign at Taluswood Place (almost at the top), and turn left, then immediately turn left again into “The Bluffs” complex. #17 is the end unit in the third cluster directly over the entrance to the parking garage and is well-marked. 1) If you have special requirements or requests, please let us know and we'll do our best to help you with them. 2) If you break or damage something, please let us know so we can work with you in the most reasonable fashion. 3) Our costs jump consistently when we have more than 4 guests, so we charge an additional $25 per guest per night for the 5th and 6th guests.